Joint pains are something many people experience later in life or even sooner, due to a sedentary lifestyle, aging, or even too intense physical activity. Various causes lead to the destruction of the cartilage holding joints together, and of the liquid maintaining them flexible. Certain compounds, such as glucosamine, hyaluronic acid and chondroitin were tested and proved to be helpful in rebuilding the lost cartilage and liquid, so treatments containing them are quite efficient in providing users with more flexible joints and pain relief. Such a product is Schiff Move Free Total Joint Health Advanced, which contains all the key ingredient for a health joint supplement. Let’s see how this product can help reduce pain and improve joint condition. Glucosamine, MSM and chondroitin have great effects in promoting joint mobility and reducing pain, especially when used together. Also, hyaluronic acid is another guarantee that this product is good for treating aching joints. However, the lack of traditionally used herbs for joint treatment was disappointing. The recommended dosage is three pills daily, taken all at once, or separately, but always with meals. A bottle with 60 capsules, enough for 20 days, is priced at 19.99USD. The company selling Schiff Move Free Total Joint Health Advanced Plus MSM offers 30 days money back guarantee policy, calculated from the date of the purchase. 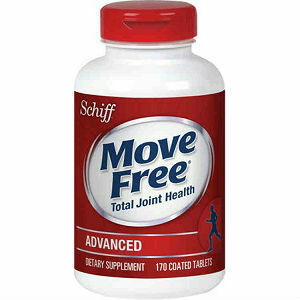 All in all, Schiff Move Free Total Joint Health Advanced Plus MSM is a fairly decent product. It contains some key ingredients to increase joint flexibility, provide pain relief and promote healthier joint health. However, it does not contain many of the clinically proven herbs and traditional extracts often used to treat joints, which definitely lowers it appeal for us. We appreciated the fact that they offer a money back guarantee and the price is pretty much the same as others out there. We would like to have seen a few more positive reviews to get a better understanding how effective this product really is. Mark Stevens	reviewed Schiff Move Free	on July 25th	 and gave it a rating of 2.5.